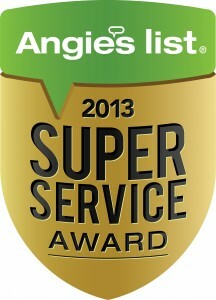 Amistee Air Duct Cleaning and Insulation in Michigan has won the high status of a “Super Service Provider” on Angie’s List in Southeast Michigan. When you are looking for a quality duct cleaning contractor for your Michigan home, you should always hire a reputable company. Using a service like Angie’s List helps homeowners connect with companies that have been reviewed by “real” previous customers. Amistee Air Duct Cleaning servicing Metro Detroit for air duct cleaning and insulation has close to 200 A+ reviews setting the duct cleaning experience on a higher level for Amistee customers. If you are looking for quality air duct cleaning in Southeast Michigan, contact Amistee located in Metro Detroit servicing Southeast Michigan for all of your indoor air quality needs at 248-349-8877. When it comes to duct cleaning certifications the National Air Duct Cleaners Association is it. NADCA offers several certifications for companies to get including ASCS (Air Systems Cleaning Specialist) and CVI (Commercial Ventilation Inspector) and technician training certification. In the State of Michigan all duct cleaning companies need to hold a Mechanical Contractors license by law in order to properly clean air ducts. When looking for the best air duct cleaner in your area, check www.NADCA.com to see if your potential vent cleaning company is affiliated with NADCA and also check with the State of Michigan or ask your prospect company for the mechanical contractors number. These are both great first steps to ensure you get a company who is taking the proper steps in delivering quality duct cleaning. Amistee Air Duct Cleaning has serviced the Downriver area of Michigan for duct cleaning since it opened its doors. 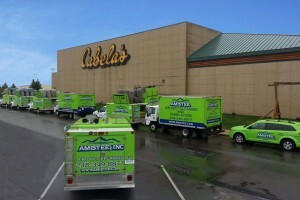 Amistee has a fleet of vacuum trucks that will travel to your location in southeast Michigan to clean your air ducts. Many homes in the downriver area have never had their air duct cleaned before. In most cases, the homeowners are unaware that duct cleaning is even needed. Air duct cleaning will help reduce the amount of dust inside of your home and also help eliminate unwanted particulates that may be in your air. 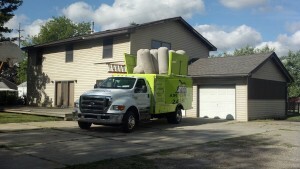 Amistee Air Duct Cleaning MI will park one of its large vacuum trucks in your driveway and then go to work from there. All floors will be properly protected to eliminate any damage to your homes flooring. Each technician will cover their shoes with protective coverings. Once we have protected your home, it is time to start getting set up to clean your air ducts. We will assemble our suction home that leads from our vacuum truck to your furnace location. Once inside of your furnace room we will make the appropriate access into your ductwork and attach our equipment to that. When we turn our truck on it will be pulling a large amount of air out to our vacuum truck. The idea is to remove all of the debris that is on the inside of your ductwork and get it to our vacuum truck. We will go to each individual duct to clean them and spend roughly 75% of our time in your basement. In your basement we will be cleaning all of your main ductwork and individual duct runs and then focus on cleaning your furnace. Once complete it is time to clean your home up making it look as if we were not there. To get treated with our exceptional service for cleaning your downriver Michigan home in Southeast Michigan call Amistee Air Duct Cleaning today at 248-349-8877.